This set is tested and works well. AM-3349/GRC-106 POWER AMPLIFIER , amplifies 100 MW output from RT-662/834 to 400 W PEP. 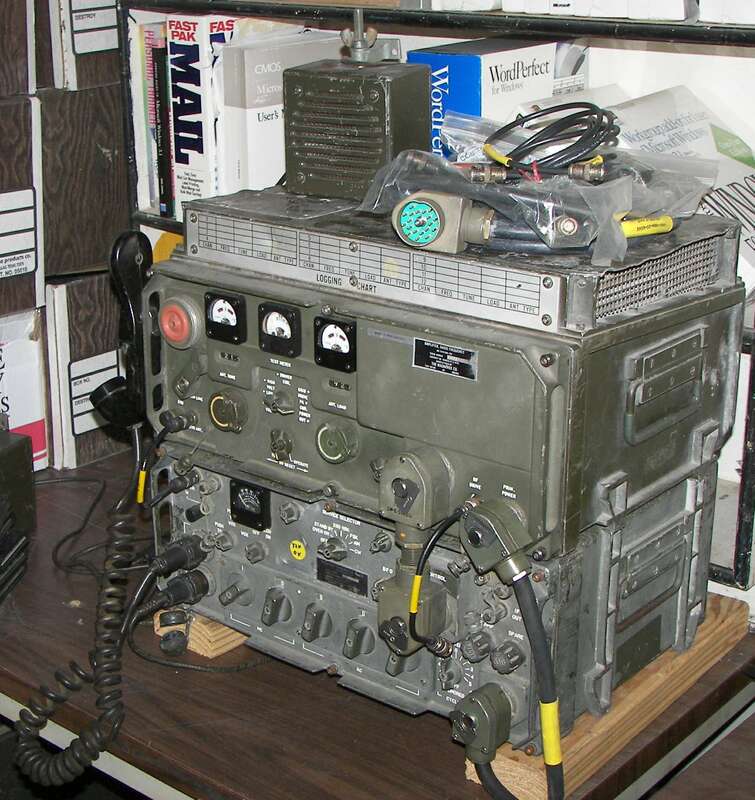 AM/USB/CW/FSK continuous duty. 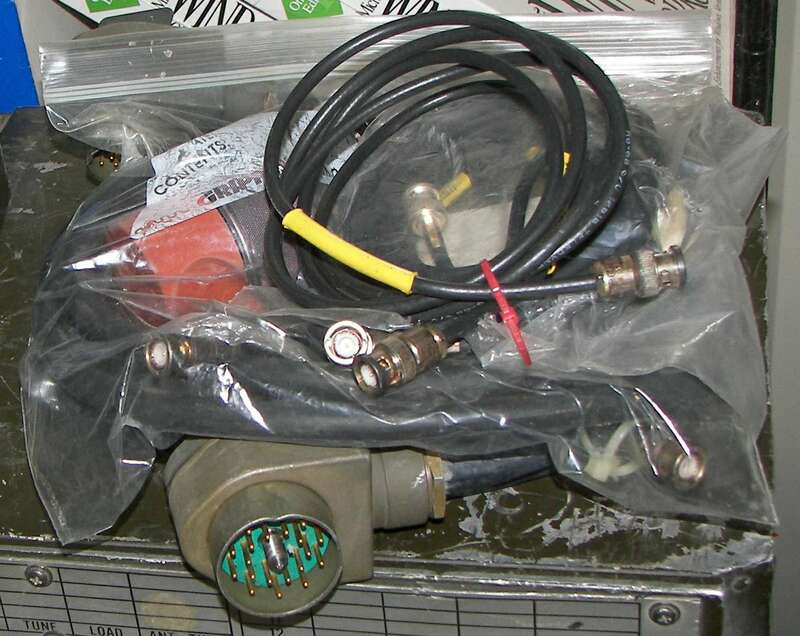 Uses two 4CX350F tubes in PA. Controls for ANT TUNE and LOAD, 50 ohm line and unbalanced HV RF output for wire/whip, Test Meter Function and system ON-OFF. Requires 28 VDC 1000 W max. 9x18x13, 77 lbs. RT-662/GRC-106 TRANSCEIVER, covers 2 to 29.999 MHz USB-AM-CW-FSK; tunes using 5-decade mechanical switiches to 1 KHz increments plus vernier. Exciter output 100 MW. Controls for Service Selector, PA Load, Squelch, Noise Blanker, BFO, and other audio functions. Signal Level meter. Requires 24 VDC 10 amps; 7x18x13, 56 lbs. PP-4763/GRC POWER SUPPLY , produces 28 VDC 50 amps from 115 VAC 22 amps 47-63 Hz 22/11 amp input; solid-state with +/-0.5% regulation. 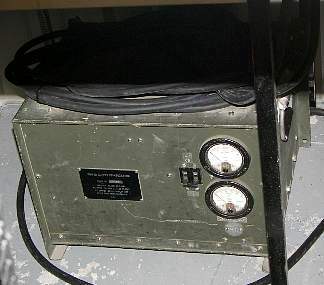 0-50 VDC and 0-80 amps DC meters; 13.5x 19.5x15, 145 lbs. Handset, speaker, short "dogbone" inter-unit connector (installed), short BNC RF interconnect cables (installed), power cables, HV RF Longwire/whip antenna cable, long inter-unit connector cable, long BNC RF interconnect cables. Some are sitting on top of the radio set. The long interconnect cables are used when it is desired to mount the amp and radio side by side instead of stacked in a mount. 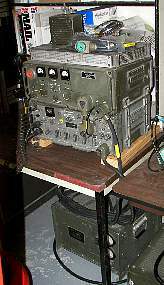 Tuning is simplified and fully automatic with the RT unit controlling the tuning of the amplifier, except for the final amplifier plate and built-in antenna tuner which are manually tuned with two knobs using two meters. You simply put the set in 'tune' mode and zero the meters. As long as the tuning meters, which are actually phase meters, are centered, the tuning is correct. 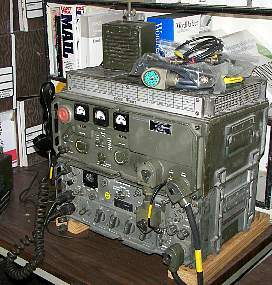 A key can be connected as well as an AFSK device and an handset/microphone/headset. Transmit is break-in with the key, PTT, or VOX with the handset or microphone. The frequency is set with the decade knobs. The unit incorporates a thermally stabilized crystal oven inside the frequency reference. It takes about 20 minutes to become fully warm. The transmit function may be operated within 2 minutes of turning the set on, and even with a cold standard. Receive is ready as soon as the two tubes in the robust and well-filtered EMP-resistant front end warm up -about 30 seconds. These units are not commonly available for sale in good working order, and are quite expensive in any condition. AM-3349/GRC-106 POWER AMPLIFIER: $750 "as-is/repairable"
AM-3349/GRC-106 POWER AMPLIFIER: $650 unknown cond. AM-3349/GRC-106 POWER AMPLIFIER: $525 unknown cond. AM-3349/GRC-106 POWER AMPLIFIER: $375 unknown cond. RT-662/GRC-106 TRANSCEIVER: $450 "checked" -means it seems to work OK but calibration etc. not checked. 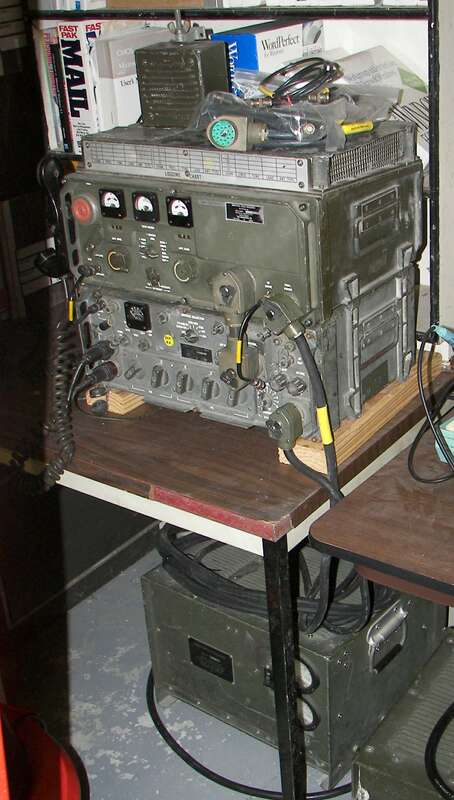 RT-662/GRC-106 TRANSCEIVER: $500 unknown cond. AN/GRC-106A: RT-824, AM-3349, RF & DC pwr cables: $650 unknown cond. So, if you are considering one of these great sets, be aware they can be costly to purchase in good working order. They are not too hard to work on and modules are fairly available, so there's no harm in taking your chances. Even better, the sets use transistors (no IC's) and a few easily obtained vacuum tubes, so a technically competent person can repair at component level. At that point it's time and material..
One advantage of this set is that the 350 watt 4CX350F PA tubes can be substituted with the slightly lesser 250 watt 4X150D and 4CX250F types which also have the 26.5V heater voltage. They will do just fine of you don't abuse the unit and are rated for 590 watts of output under normal conditions anyway. Since the PA tubes are 26.5V heater voltage, they are less called-for and therefore not very expensive. The greatest caveat in operating the unit is to tune it properly, by the book. When properly tuned according to the two tuning knobs and two tuning meters on the front panel, you will always get the correct match and the 400W PEP output (Remember, this was designed to be tuned up by soldiers, so it is purposely ruggedly made and simple to operate). You can get almost 600W PEP/CW out of it by using a scope and "loading it up", but this is a mistake because the screen current in the PA tubes will be excessive and can cause the tube(s) to fail. If this happens, the HV power supplies will just shut down, no other harm done. These sets are tough!